2014 Redbull winner Andreu Lacodeguy airs it out. Photos by Rob Norbutt. 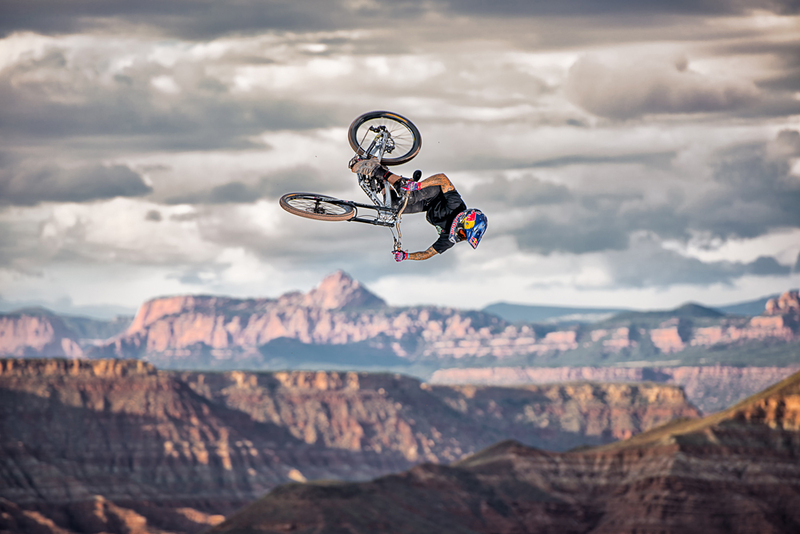 The 2014 Redbull Rampage, held from September 26-29, 2014 in Virgin, Utah, raised the bar of epicness in every category for those who worked, rode attended the event, especially those from Utah. Since the first freeride contest in North America, staged in Moab in 2000, and won by Salt Lake City’s Kris Baughman, Utah has been the terrain that defines freeride. 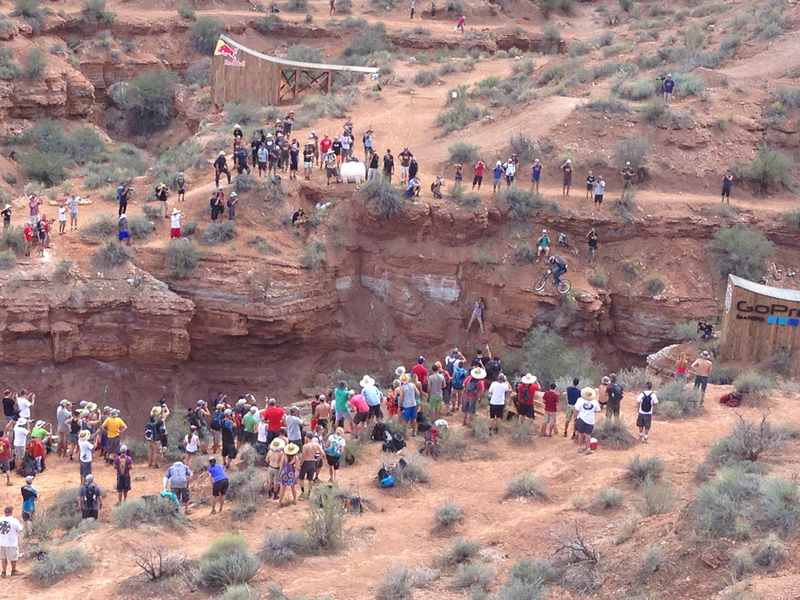 Of course Redbull recognized the unique combination of steep and forgiving that defines the mesa shoulders in the Virgin area. New this year, was a site move, over the ridge, which extends to the north off Gooseberry, to the steeper east facing clawed mesa face. But let’s not get ahead of ourselves, the original (OG) Rampage site and adjacent campground had been occupied for weeks by dozens of riders, diggers and hangers on, many raided from the broader Utah freeride scene. Some of the pro builders went down to Virgin as soon as the season wrapped up or as was the case for Mark Kugel , as soon as he could leave his day job at the Canyons and head down. Kelly McGarry and Carson Storch seemed to employ a good portion of the Park City and Wasatch freeriders as their build crew. Wil White tapped Jeremy “Kickstand” Hottinger (who should have been riding in Rampage) and Lorin Whitaker for their local knowledge and insight. Last year’s “Cat Like” Rampage award winner Dustin Schadd was inexplicably digging for the French (Pierre Edouard Ferry) and the Belgian (Thomas Genon). Amongst the other Utah diggers and workers at Rampage were Ben Van Amerante, Jordan Einers, Eric Porter, Carston Oliver, Nat Paton, Bryce Sacks, Alex Falkenstein and Mike Kelley (not clear about the work, here). In addition to the dig crews, Utah was represented by two riders, Chris Van Dine, a multi-time Rampage veteran and adventure rider, and Mitch Ropelato, downhill, endure, and freeride prodigy who seems to be walking on mountain bike sunshine as of late. Even with a week of advance building, the challenges of understanding a new site and adapting to the opportunities and steepness made it difficult to nail lines. Fan favorite Wil White had a run on a completely custom line, that may have been a little obscure, and with no spins or flips, failed to transfer out of quals. Adopted Utahan, Kelly McGarry kept with his bike destroying ways exploding his rear wheel (and ankles?) with a canyon gap backflip attempt. CVD nailed a back flip on the Polaris jump at the bottom, but failed to make it out of qualifiers due to trouble on the billy goat trails at the top. 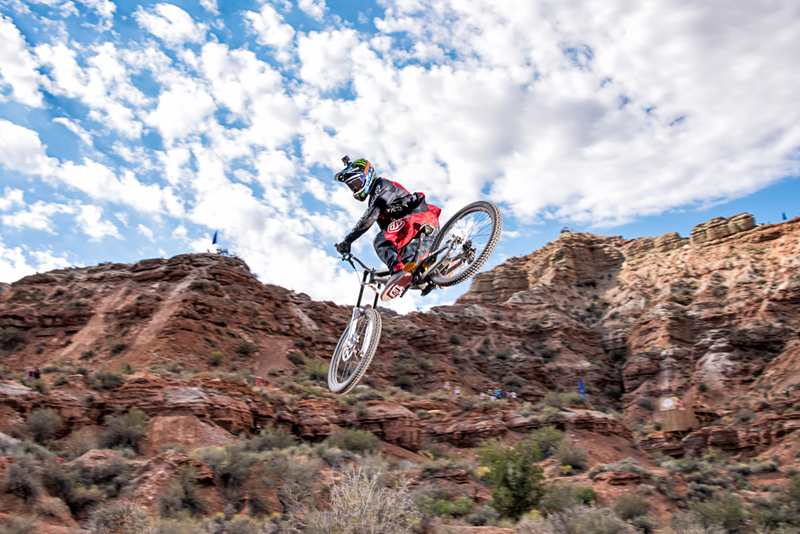 Mitch, too, relied on a back flip at the bottom to boost his score, and combined it with clean, clipped in, stylish riding to finish 10th overall, making him an automatic qualifier for next year’s Rampage. Another big story at Rampage was the weather, which if you haven’t been paying attention last six or so Rampages, can be variable (Pro tip, think of it as a 5 day). 2014 did not disappoint with a torrential downpour that lasted from about 6am until 1pm on Saturday, the rest day between quals and finals. The camping area where many fans stay, just across from the OG Rampage site, was nearly inundated as Kolob creek, normally 12 feet wide and 8 inches deep swelled to 60 feet wide and 8 feet deep. The Sheriff acted to evacuate the bottom land campground, with some abandoning their (2wd) vehicles, others getting stuck and still more making it out scraped and packed with sand. Around 1 pm, the creek crested, about a foot below the campground level leaving little more damage than a lost tent, and flip flops amongst the 300 or so campers. As any rampage loyalist knows, the dirt turns to cookie dough with the addition of rain, paradoxically fluffing up and becoming packable at the same time. The fans and locals made quick work of building an entirely new line, Mydo, while the kickers and other lines got a solid tune. With the now perfect weather and conditions, MtnRanks Fanpage was back on in an abbreviated a 5-dollar trick format. Brett Tippie and the Pinkbike crew stopped by as the young rippers like Andrew Bird stole the show with style, tricks and incredible air. With finals delayed until Monday, the fun riding continued on Sunday, with many folks opting for a Grafton or Flying Monkey lap and others pounding themselves at the OG Rampage site. As the finals showed, the new Rampage site has a ton of promise and, as proven this year, the locals know how to have a good time even under the worst of conditions. We’ll be back next year for a whole different episode of epic. 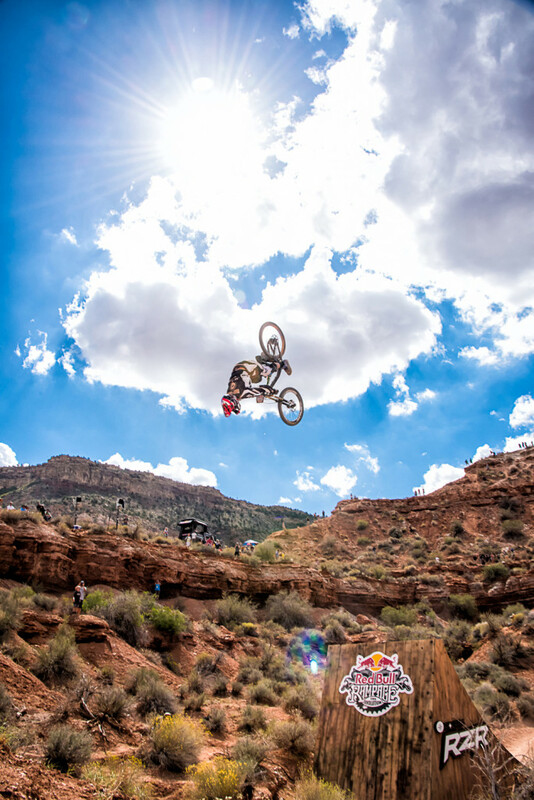 Chris Van Dine front flip at the 2014 Red Bull Rampage. Photos by Rob Norbutt.